How do I know if my purchase is secure? Adventure Cow uses Stripe to process our payments. This means that all payment information is encrypted. None of your credit card information is ever stored on our servers. 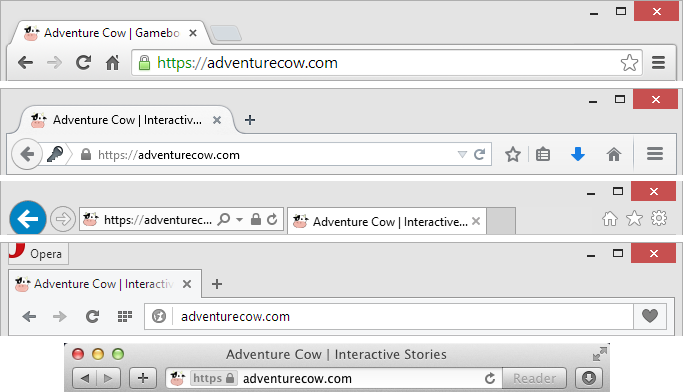 As a secondary layer of security, we encrypt all purchasing communications with adventurecow.com via SSL. You can make sure your communications are encrypted by looking to the top left of your address bar. If you are using a secure connection you should see a padlock, and the URL should start with "https://adventurecow.com". If you do not see the padlock or this address, email us. We currently support US dollars (USD) and Great Britain pounds (GBP). Regardless of your local currency, you should still be able to purchase DQI using either option. Your bank will translate the charge into the appropriate currency. Check your bank for details on fees - each bank is different. Help! I still can't purchase DQI! Email us at support@adventurecow.com and we'll help fix the problem. If you can find where you got stuck in this list of screenshots let us know.